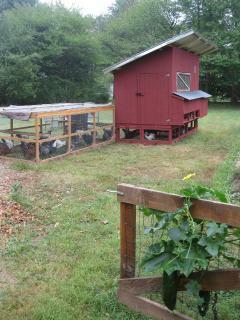 I looked high and low for plans for a chicken tractor that could accomodate 2 dozen hens to no avail. I finally decided I would have to design my own. 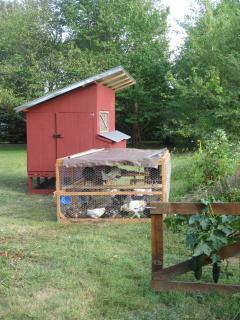 Having made the chicken tractor, I realize why it did not exist. Its scale is on par with a parade float. Okay, thats an exaggeration, but not by alot. My first step was to figure out what the goals were. 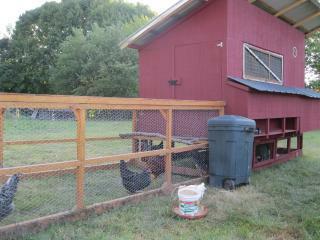 I really wanted the girls to have access to fresh grass daily. I also wanted the footprint to match that of my garden beds (5x20 sq ft) so I could use the tractor to enrich existing beds and help create new beds. 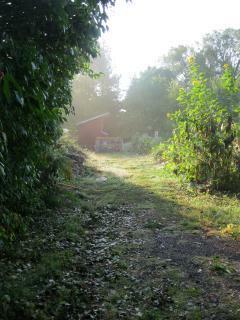 Ample floor space, run area, nest boxes, and roosting space were also considerations. As was trying to keep the weight down so that it would indeed still be mobile. 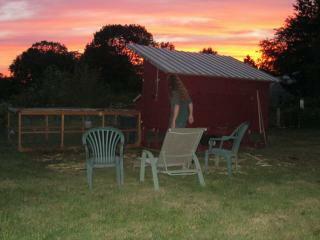 What we ended up with is a modular design including a mobile coop with an enclosed run under it and a portable run that detaches and moves around the coop providing secure access to fresh pasture daily. 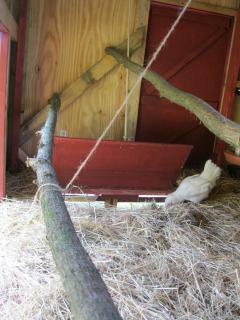 A recycled door along the back of the coop props open to allow you to rake out the bedding onto a tarp for easy cleaning. The run under the coop has removable chicken wire side panels all around that provide access to the portable run in 8 different positions. This means the coop itself can stay put for 8 consecutive days. Only the run gets moved on a daily basis. 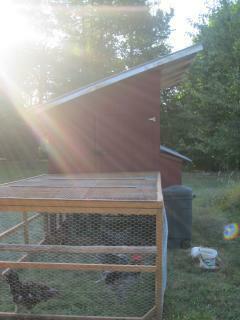 The mobile coop is moved once every 8 days. 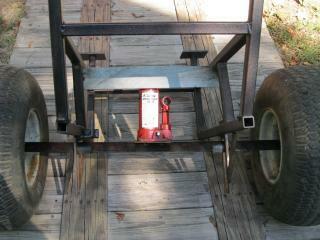 A bottle jack fitted between the axel and the frame lifts the coop off the ground so the large lawn tractor tires can roll freely to move the coop. 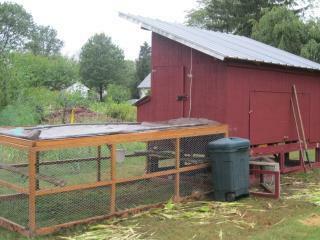 Once the coop is moved the jack is released and the coop rests on its base. 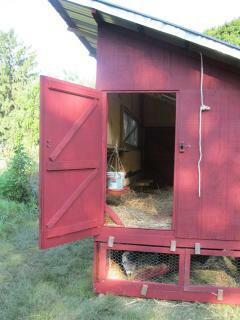 Doors on either end of the coop allow for easy access to the coop. A rope pulley allows the pophole in the floor to be opened from the outside. A pophole in the floor provides access to the shaded run below. 20 feet of roosts from tree prunings are suspended from the walls and ceiling so that the floor remains open for ease of cleaning. A vented ceiling is covered with 1/2 inch hardware cloth to keep predators out and provide ample ventilation. 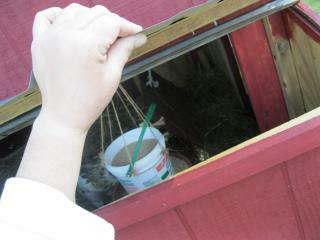 A window above the nest boxes sheds light and lends additional ventilation in summer months. 6 nest boxes (covered until they start laying) are tucked in the dark, private space under the window. 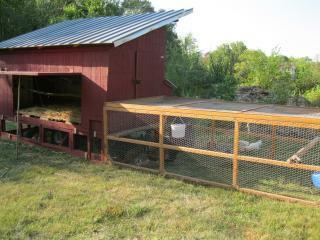 There are hatches that provide access to the nest boxes and feeding station while standing comfortably outside the coop. 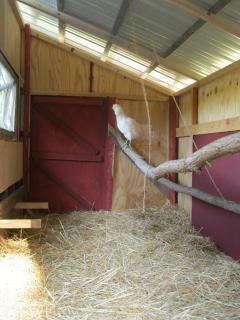 Shelving under the nest boxes provides a spot to put eggs and keep other items handy. A wheeled trash can provides mobile feed storage. Ahh!! 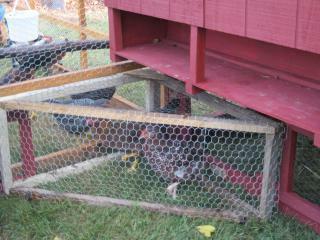 Now its time to sit back and relax and watch chicken tv. 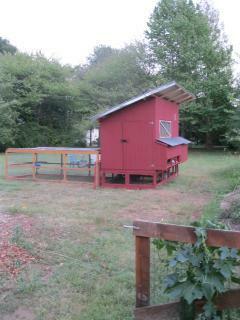 "Movable run and tractor coop"
This is a great idea. I like that the run fits over your garden bed and is sized to match. Easy bed clean up. I'm a little hazy on how each side is opened/closed when the run is moved to another spot on the 'wheel'. Very detailed, with great photos! 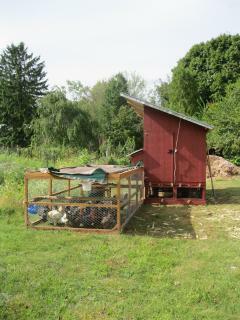 I think that's a clever design for a coop! 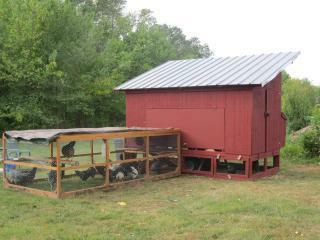 Large chicken tractors are really heavy and it seems like this design took that into consideration. Very attractive and well thought out with the removable run. 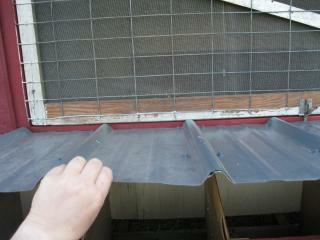 It would be nice to see some more detailed pictures like how you hinged your nest box lid with the metal roofing.